I love sipping on a great tasting cocktail every once in awhile as it's a great way to relax, unwind and just de-stress after a long week of work! How about you? I know you do too! Anyway, the great folks over at Three Olives Vodka asked me to share this yummy cocktail recipe with all of you! Preparation: Drizzle chocolate syrup in a martini glass. Combine vodka, dark crème de cacao , and coffee liqueur in shaker filled with ice. Shake vigorously. Strain into martini glass. 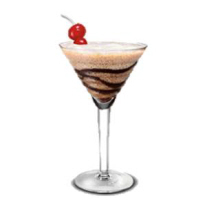 Top with whipped cream and garnish with a maraschino cherry. Disclaimer/Disclosure: The recipe & photo was provided to us by Three Olives Vodka. You must be 21 years of age or older to consume alcohol. Please drink responsibly.